WILL THE STOCK MARKET CRASH IN 2017? Will the stock market crash in 2017? This is one of the most common questions I get on my channel. Many are predicting that there will be a stock market crash or market correction that takes place in 2017. This bull market that we are in is getting frothy and many economists are concerned. A stock market crash is likely on the horizon, but will it occur in 2017? Many have concerns over the stability of the economy as a result of the election of Donald Trump. Could a major global event result in an economic collapse of United States markets? This bull market will likely be followed by a bear market, the question is when will the markets see a correction and how severe will this stock market correction be. 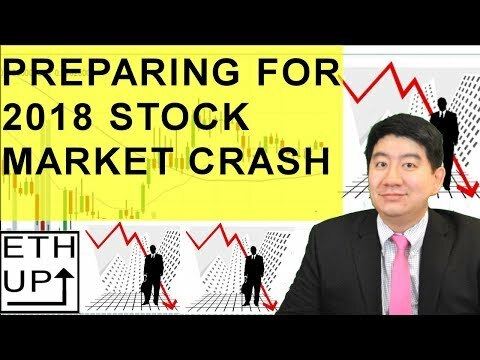 In this video, I talk about my opinion on whether or not the stock market will crash in 2017 or in the near future, signs that a correction is looming and what to do when the markets crash or when a correction takes place. Will this bull market continue or are we going to see a bear market in the near future? Let me know what you guys think in the comments below. This is a very good video! I was expecting the markets to nosedive mid last year since it was quite a while since the last crash. Hopefully when things hit the fan they wont fall too hard. My philosophy is buy low sell high not buy lowest and sell highest. Too many people freak out about getting the lowest price and end up missing a great opportunity. Also I rather take a profit than wait for the absolute highest and miss money in the bank. Great point my dad always said the stick is just on sale. I bought CVX when everyone hated oil and sold it at it's all time high. Best investment I have made to date. Very nice vid, you actually analysed everything reasonably and listed the facts haha. I started being hesistant last year as the stocks are overpriced, but like you say they are 132% now but for all we know they go up to 150%+ before they come crashing down. I'm not doing any new money toward stocks as I believe once the crash happens in 1month? 3 years? I can get much better prices. market is reaching extreme valuations compared to historical averages. We are definitely due for a market correction. I dont think that we will have a nationwide recession like 2008, but market should go down by 15-20%. Hats off Ryan! This video is awesome, and your voice is really calm and firm to let people believe a market crash is actually a good thing! I can't wait for next market crash which would be the first one in my investing life. How do you invest in an index fund? Do you just buy certain stocks or is it like an IRA? People there is no recession for another year and a half at least.. The S&P needs to hit around 3,500. Its because the FED interest rate was held so low for so long. Hopefully I'll be able to have a nice little chunk of change set back by the time this happens. I have 2k in a etf with gbp ( english pond ). But im kinda worryed that UK will leave eu and gpb will crash, what makes my Etf investment in the biggest londen market lose my money. can you drive a stock at 50%off? what about wear a 50% off stock? exactly. The question facing us right now is not whether or when a correction will take place. Bear markets are as natural for capitalist economies as periodic famines are for agrarian economies. As you point out in this video, we are already substantially overdue for one. The question is whether we are in a position to coherently and rationally respond to such an event. Your framing of a market crash as a buying opportunity for the savvy investor is based on the assumption that markets will react as they have through the mid and post Bretton Woods systems of international finance. These systems were put in place generally to prevent they type of nationalist, isolationist, "beggar-thy-neighbor" policies which turned a market crash into the Great Depression. The imposition of just that type of policy is one of the only reliably held beliefs of the current president. Similar sentiment is gaining traction around the globe. If we collectively respond irrationally to a market crash, things could turn very ugly very fast. Thanks for your opinion on this, nice video! So if I understand correctly, we MAY see a crash in the near future. However, this doesnt mean I should now sell all my equity funds, right? Would be wiser not to buy new ones right now, but wait until the crash to buy them on sale. Correct? The only question is: if some say this is most likely the most severe crash since the 50's, will my stocks likely still recover when we are back to a bull market? ?